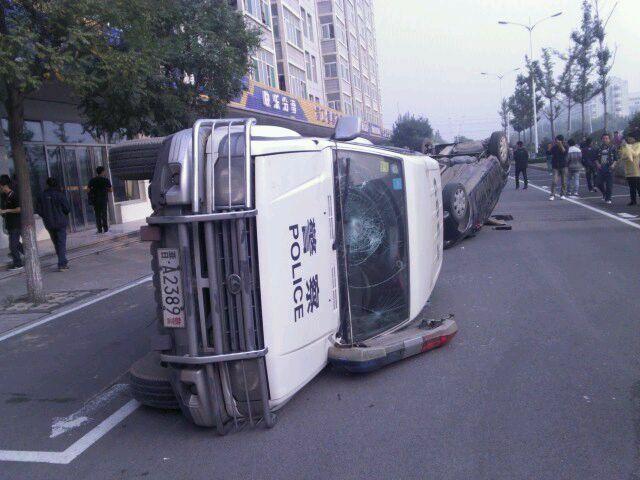 In the evening of September 23, a riot broke out in Foxconn's factory complex in Taiyuan, Shanxi. 2.000 Foxconn workers took part in the riot, many thousands looked on, and 40 people got injured. The rioters smashed shop-windows, set fires on the street, over-turned police cars and demolished company fences. 5.000 police were sent in but did not bring the situation under control until the early morning hours. There were no reported arrests. Foxconn stopped production for the following day in the whole plant. While Foxconn initially claimed that the riot started when a dispute among workers from different provinces got out of control, workers' reports paint a different picture. It all started after company security guards intervened in a personal fight in one of the dormitories. When the security guards started beating people, the workers went to get support. Thousands had just finished their shift, and many got involved and took the chance to express their anger. There had been many cases of harassment and violent attacks by company security guards against workers before, so tensions were high. The methods of the guards are part of Foxconn's strict and paramilitary management of both workplaces and dormitories. This includes fences, gates, security checks and correlating rules and regulations. However, there is more behind the riot: Foxconn needed more workers for the production of parts for the new iPhone 5. So workers were transferred from factories in Shenzhen and Zhengzhou to Taiyuan. Still, most workers do not want to go to a provincial city like Taiyuan, but rather stay in coastal boom-towns. Furthermore, most workers do unskilled, repetitive, monotonous tasks, ten to twelve hours a day. The relocation and job-transferns from coastal to inland regions with lower wages mean that many experience a wage loss, and often the paid wage is lower than promised. So most workers do not like the factory work. The riot was caused by their dissatisfaction and repressive working and living conditions and only sparked by the security guards' attack. On Friday, October 5, workers in the Foxconn facility in Zhengzhou, Henan, went on strike over working conditions related to the production of iPone 5-parts. In the previous days, a wave of customer complaints in the USA and elsewhere about scratches on the back cover of the new phone lead to raised quality standards in the Foxconn plants, apparently, without giving workers adequate training. The strike broke out on the On-site Quality Control (OQC) line. It all started when workers and quality control inspectors in one area (K) started to fight which lead to some injuries and property damage in an inspection room. Later, quality control inspectors got beat up again in the area K, and inspectors in area L received physical threats. Foxconn's management ignored the complaints of quality inspectors about these incidents, who, for that reason, went on strike so that work came to a halt. The work-stoppage involved 3.000 to 4.000 people. iPhone 5-lines were stopped for the entire day. 2 Later, Foxconn denied the reports and stated that there was no strike. Foxconn and Apple have already been under rising pressure since a series of suicides in 2010, when almost twenty workers jumped from different Foxconn buildings over the course of the year. Foxconn reacted by installing security nets and window bars at their buildings and by announcing wage increases. However, according to workers accounts the wage increases were accompanied by faster work speed and increased unpaid overtime hours. 3 The ongoing problems have lead to more workers' struggles. In China, the official trade unions (ACFTU) are affiliated to the local state, while independent unions are banned. The Foxconn-section of the ACFTU sides with the employer and tries to prevent militant labor actions. Workers have to organize autonomously at the workplaces and in the dormitories. The new generation of migrant workers that works for Foxconn and in other export plants dislikes the unskilled and monotonous factory work, the low wages, the harsh management. It expects improvements and progress in their personal lives, only to see that they are exploited as workers and discriminated against as migrants. Workers have access to modern communication; weibo (Chinese twitter) in particular plays an important role in disseminating information among them. Workers do know that Apple sells millions of products they produce and makes high profits, while their wages remain low and working conditions harsh; and they know that workers in Foxconn factories go on strike or riot. Therefore, Foxconn workers have – alongside other migrant workers in China – constantly pressed for higher wages in the past few years. At the same time most of these factories have high turnover rates. The question is whether after experiencing exploitation and abuse Foxconn workers "just leave" or "stay and fight." It seems that they increasingly try the second option.